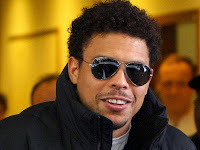 Newly-promoted Corinthians are planning an audacious move for 'El Fenomeno' Ronaldo to mark their return to the Brazilian top flight next season. Corinthians are considered to be the second-best supported team in the whole of Brazil and are keen to reinstate their image as one of the country's elite clubs after financial difficulties emanating from their partnership with MSI have shackled them over the last couple of years. Securing the signature of three-time FIFA World Player of the Year Ronaldo would certainly go some way to doing that, and the club are currently searching for financial partners to put together a big money offer for the 32 year old. Ronaldo is in the process of recovering from knee surgery following a career threatening injury suffered playing for AC Milan in February and could be on the lookout for a club in the new year should he decide to make a comeback. He has previously stated that the only Brazilian club he would consider playing for is Flamengo - the team he supported as a boy - but Corinthians are hopeful of twisting his arm with an irresistible financial package, despite the small likelihood of him accepting such an offer.